I panicked when Carl first proposed a Pre'Ween article swap between our sites. After all, The Info Zombie boldly asserts that it feeds one's hunger for brainy stuff. Movies At Dog Farm is mostly just my own personal internet drool cup. What brain-tickling wisdom could I possibly have to impart? Since you couldn't know this, let me tell you that I just stared blankly at an empty laptop screen for twenty minutes. I know movies, though. By extension, I know how to watch movies. Now before you take offense at the implication that you don't, you should know I often have to consciously remind myself of several of these commandments, as well. We know, but like children, we forget. Anytime I don't enjoy a movie, I have to ask myself if I really gave it a fair shake. 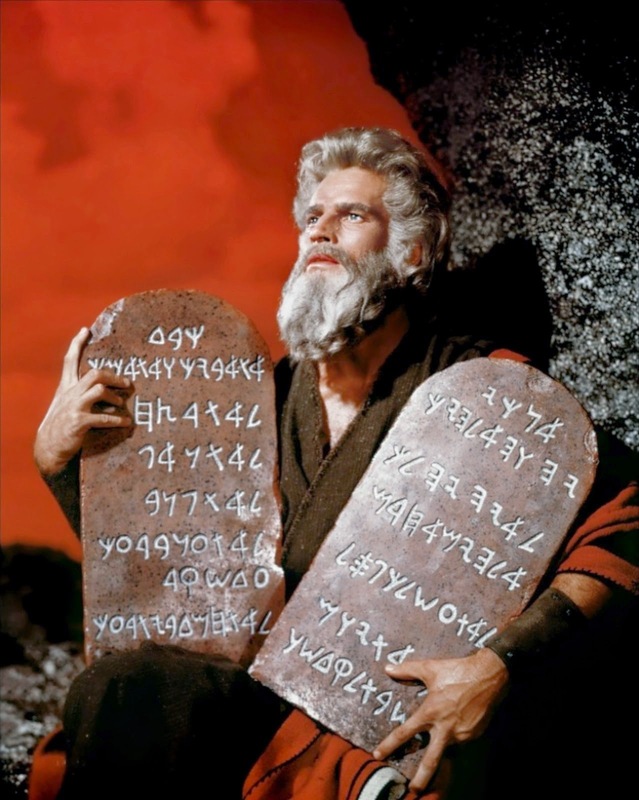 If I broke two or three of these commandments while watching, I probably didn't. I probably break this commandment more than any other. It's imperative, though. We all know that spectating cavemen blew out their torches before watching the mastadon show on a lit cave wall. That urge is deeply ingrained and primal. Ignore that urge at your own peril. The lights go down in the "auditorium" when the movie starts, and they stay down until it's over. Unless you live in an underground bunker - or perhaps your mom's basement - you shouldn't watch horror movies in the daytime. A prone position plus a darkened room equals nap time. No matter how good a movie may be, you won't absorb that fact by osmosis when you fall asleep. There's a reason theaters used to advertise air conditioning. You should be cool when watching, but not cold. It keeps you alert. Also, your home theater being too warm and toasty is another one of those things that heralds nap time. The only exception here is if you're watching drive-in movies and trying to recreate a balmy summer evening. Honestly, though - if that's the circumstance, you're probably going to put yourself to sleep with that twelfth beer anyway. In short, don't try to multitask while watching a movie. Multitasking is a lie. No-one can multitask. Some people may be better able to quickly switch focus from one task to another, but no-one can really do more than one thing at a time. Multitask, and your viewing experience is compromised. Part of the fun of watching a good scary movie is watching others get scared. It may not be practical to recreate the communal experience of the theater at home, but you should always arrange for at least one other viewer to join you. Remember, though, that you're only focusing on one task now, so no conversation. That other viewer is only there so you can feed on their fear in the dark. A decision has no significance if it has no consequence. If you go to the bathroom, you're going to miss some of the movie. Now weigh just how badly you need to pee against how much you don't want to miss some of the movie. Choose wisely. Any fiddling with audio and video should happen before the movie begins, and we've already established that you won't be pausing the movie for bathroom breaks. Drop the remote and step away. You're going to lunge for it the first time the volume spikes, but you must resist the urge to change the volume once the movie begins. If the movie is really, really quiet and then it gets really, really loud, trust that was the filmmaker's intent. Allow yourself these few minutes to revel in the anticipation of the main event. The trailers are your movie watching foreplay. They give you time to acclimate yourself to a movie watching mindset. If the movie doesn't have any trailers attached to it (VOD), then find a couple to watch beforehand. Vudu makes it easy. You are hereby granted authority to pick up that remote for a moment if you have to navigate to the trailers. You're only granted temporary immunity from number seven for that, though. Drop that remote like it's hot again afterwards. In other words, eat only quiet concessions like popcorn, soda, and hot dogs. Raisinets are allowable as long as you don't jiggle the box incessantly. Nothing is louder - or more distracting - than someone trying to quietly open a bag of potato chips in a dark room. I'm expecting some resistance to this one. What about the grand old tradition of the double feature, you may ask? When double features were still in vogue, movies were generally shorter than they are now. They were shorter because it was understood that they'd be playing on a double bill with another movie. If you want to watch The Giant Gila Monster (1959) and The Killer Shrews (1959) together, fine. Don't watch The Exorcist (1973) and Rosemary's Baby (1968) together, though. You'll grow fatigued during the second feature, and your appreciation of it - no matter how good a movie it is - will be compromised. Try adhering to these commandments for your next movie night this Pre'Ween, and I can almost guarantee that your horror movie experience will be improved. If not, please feel free to blame The Info Zombie for trying to get me to write something brainy. He should have known better. Great list! I'm definitely the most guilty of breaking commandment #4, because I love to look at the IMDb page of everyone in the film while watching. My bladder precludes me from making it through without getting up. Then again, I would rather watch at home than deal with the throngs of people with intensely bright phones that carelessly shine those beacons during films. Sounds like I'm getting old. Well, I am. But I will love movies all my life, damnit! Given how much coffee I drink at home, I usually have a problem with the bathroom breaks, too. If I absolutely, positively must - I only get one, and I make a conscious effort to do it at a point that doesn't entirely destroy any "mood building". Last night was a good example, though. I made it through the entirety of Guardians Of The Galaxy with no break, but I had to pee like a Russian race horse by the end. It's easier when I'm truly engaged by what I'm watching.